The popularity of Baha'i can largely be attributed to its attempts to unify all faiths, prophets and the entire human race. It embraces the humanist philosophy that all religions should be embraced equally because they are not contradictory and are merely successively updated versions of the same basic religious beliefs. They teach that all religions are the result of the same God and the differences stem only from the age in which they were revealed. They promote gender, racial, and economic equality; universal education; harmony between science and religion; balance between nature and technology; and the development of a world Federal system. Those who believe in absolute truths, such as those found in the Bible, are dismissed as intolerant and an obstacle to world peace. Baha'i grew out of Islam, and is in fact a stepchild of the Islamic faith, albeit a despised one. Rather than naming Muhammad as the greatest of the prophets as the Muslims do, Baha'is hold Baha'u'llah to be the greatest of the prophets. Baha'i was started in 1844 when Mizra Ali Muhammad ("the Bab" or gate) proclaimed he was the greatest manifestation of God yet to appear. The Bab is purported to be a direct descendant of Muhammad and he claimed to be the fulfillment of the scriptures of all of the world's religions. During his brief 6 year ministry, he taught of another manifestation that would follow (similar to the role of John the Baptist). This manifestation would be even greater than he, and in 1863 Mirza Husayn Ali proclaimed that he was the Great prophet the Bab had spoken of. Thirty years after proclaiming himself to be the fulfillment of all religions, Baha'u'llah died and leadership was passed to his son Abbas Effendi (also known as Abdul-Baha and "the Master") who worked as an interpreter for his fathers many writings. He is responsible for bringing the Baha'i faith to the U.S.
Abbas Effendi was succeeded by his grandson, Shoghi Effendi became the “Guardian of the Cause,” and during his lifetime, Baha’is agreed there would perpetually be such a guardian. However, Effendi died before appointing a successor. Consequently, six years after he died, the first Baha'i Universal House of Justice was elected to serve as the Guardian. 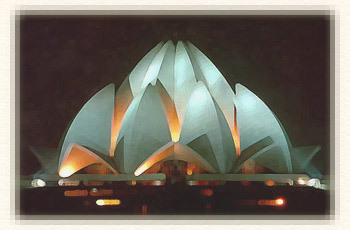 It has since been the governing body of the Baha'i faith. The Universal House of Justice is a nine-person board that applies the laws of Baha'u'llah and is made up of representatives from Judaism, Christianity, Islam and several ethnic backgrounds. The Baha'i temple in Wilmette, Illinois is a nine-sided building representing the world's nine living religions and is a combination of synagogue, mosque, and cathedral, symbolizing the unity of all religions. The goal of the Baha'i faith and its leadership is for the world to become a single super-state with Baha'i as its religion. It's no wonder Baha'i is promoted vigorously by the U.N. and plays a major part in all United Nations spiritual events. (Also See The United Nations and The Aquarian Age Community). One goal of the Baha'i movement is to bring about an all-inclusive global faith under a federalist world government. [See Section The Unholy Blend Of Politics and Religion] Their views on the nature of God reflect this desire to include all beliefs, gods, and religions neatly into their belief system. In Baha'i thought, people can never really know God personally. They teach that God is so far beyond humans that no one can really know the essence of God. While Baha'i is clearly a monotheistic faith, an unknowable God means any god will fit the mold, whether it be Allah, Yahweh or Brahma. By ignoring what the Bible has to say about God, and putting him out of man's reach, they are free to worship anything and, in some cases, everything as God. By contrast, the Bible tells us that God reveals Himself to us (Hebrews 1:1-2), wants to be known (Isaiah 45:22-25; Hosea 11:1-11), and invites us into a relationship with Him (John 14:23; Revelation 3:20). He also makes false teachings about God evidence of a false prophet, and deserving of punishment (Deuteronomy 13:1-5). Baha'is view Jesus' as merely one of many manifestations or prophets of the divine. They also deny the deity of Christ and his miracles, and argue that Jesus never claimed to be God's only Son. (See Did Jesus Claim To Be God?) and ‘They further deny that Jesus was God. In fact, Baha'i theology views Jesus as being inferior to Baha'u'llah, much as Islam views Jesus to be inferior to Muhammad. They argue that messianic passages such as Isaiah 9:2-7; 11:1-2; 40:1-5; and 53 are references to Baha'u'llah, and that the "Spirit of truth" that Jesus spoke of in John 14-16, was not the Holy Spirit, but was actually a reference to Baha'u'llah. In II Corinthians 11:4 the apostle Paul spoke of those who would believe in "another Jesus", other than the Jesus of the Bible. The Baha'i rendition of Jesus falls in this category. Contrary to Baha'i claims, Jesus was an incarnation of God, not a manifestation (Isa. 7:14; John 1:1, 14, 18; Heb. 10:1-10; Phil. 2:5-11). The Bible says that to deny either the undiminished deity or the perfect humanity of Christ in the incarnation is to put oneself outside the pale of orthodoxy. I John 4:2-3 "This is how you can recognize the Spirit of God: Every spirit that acknowledges that Jesus Christ has come in the flesh is from God, but every spirit that does not acknowledge Jesus is not from God. This is the spirit of the antichrist, which you have heard is coming and even now is already in the world." Paul further affirms that Christ is the fullness of the Deity in bodily form in Colossians 2:9. The Bible makes it clear that Jesus is God the creator, the Immanuel, and God with us. Baha'is claim that the Bible speaks of Baha'u'llah, however, the only reference to Baha'u'llah in the Bible is an indirect one when Jesus and the apostles warned of the coming of false prophets and false Christs (Matt. 7:15-16; 2 Cor. 11:13-15). The messianic verses from the Bible cited by Baha'is as referring to Baha'u'llah, can not truly support their claim because, among other things, Baha'u'llah was of Iranian descent, where the Messiah was to be Jewish (Matthew 1; Genesis 12:1-3; II Samuel 7:12-13). Also, the New Testament repeatedly cites the fulfillment of Isaiah's prophecies in the person of Jesus Christ (Matthew 1:1; 3:14; 8:17; Luke 1:31; Revelation 5:5). The second coming of Christ also can not refer to Baha'u'llah. Scripture indicates that the very same Jesus who ascended into heaven will one day personally return (Acts 1:9-11). The Bible also prophesies several dramatic and highly visible signs that will accompany the Second Coming (Matthew 24:29). None of these signs were present when Baha'u'llah arrived on the scene. He also didn't show up in the right place. Scripture clearly indicates that at the Second Coming the Messiah will come to Jerusalem and his feet will physically touch the Mount of Olives (Zech. 14:4). Baha'u'llah never did this. The Spirit of truth in John 16:12-13 also can't be referring to Baha'u'llah. John 14-16 clearly identifies the Spirit of Truth as being the Holy Spirit (John 14:16-17, 26). Jesus said that His promise of the Holy Spirit would be fulfilled "in a few days" (Acts 1:5), not in the 1800s when Baha'u'llah was born. That fulfillment came on the Day of Pentecost in Acts 2. The function of the Holy Spirit is to make known Jesus' teachings, not to replace them with the interpretations of another prophet. Jesus also said that the Holy Spirit would be with us forever (John 14:16). Baha'u'llah died in 1892 at the age of 75, far short of forever. Ephesians 1:18-21 "I pray also that the eyes of your heart may be enlightened in order that you may know the hope to which he has called you, the riches of his glorious inheritance in the saints, and his incomparably great power for us who believe. That power is like the working of his mighty strength, which he exerted in Christ when he raised him from the dead and seated him at his right hand in the heavenly realms, far above all rule and authority, power and dominion, and every title that can be given, not only in the present age but also in the one to come." The ultimate deception of the end times will involve the worldwide worship of the Antichrist. But the Antichrist will not rise to power alone. His success will result from a worldwide spiritual deception perpetrated by his sidekick, the False Prophet. The Antichrist will not appear until after the falling away (2 Thess. 2:3), but the spirit of Antichrist is already at work perverting the gospel and corrupting the church. The False Prophet will look religious, sound religious and use religious terms, but his message will be straight from Satan (Rev. 13:11). The final phase of apostasy before the Antichrist arrives on the scene will introduce a religious system to be led by the False Prophet. It will be an ecumenical, interfaith religion much like the Baha’i faith. There are nearly 130 agencies and organizations operating within the UN system, each overseeing programs that require vast sums of money and massive bureaucracies to operate. These UN programs are all strategic parts of a plan to achieve global governance and eliminate national sovereignty from the planet. Most of these programs are never covered in the world’s media and are able to operate outside of the awareness of the public they hope to govern. This giant bureaucracy is so far outside the realm of accountability that most people have no idea how it is operating or what agenda it is moving forward. Most Christians would be shocked to know how deeply involved the United Nations is in the spiritual agenda of the interfaith movement. Just as they are striving for a world government, they are also working with religious leaders and organizations to create the one world religion found in Bible prophecy - the religion that is to be an integral part of the Antichrist’s rise to power. The Baha'i community has, as a duly accredited non-governmental organization, long worked closely with the United Nations, supporting many of its goals and programs, and taking a leadership role in several international gatherings. Its involvement in the United Nations dates back to the founding of the UN in 1945. In 1947, the Baha’i communities of the United States and Canada were recognized by the UN Department of Public Information (DPI), and the next year, the Baha’i International Community itself was recognized by the UN DPI as an international non-governmental organization. In May 1970, they were granted consultative status with the UN Economic and Social Council (ECOSOC), allowing for a greater degree of interaction with the Council and its subsidiary bodies. Since then they have also been granted consultative status with the United Nations Children’s Fund (UNICEF), and relationships with the many UN bodies have deepened and expanded over the years. Today for example, the Baha’i organization has a working relationship with the World Health Organization (WHO), is associated with the United Nations Environment Programme, and is involved in joint activities with UNIFEM and UNICEF as well as many other religious, environmental and social programs within the UN, to include peace-building, human rights, women’s affairs, education, health, and sustainable development. They refer to the organized religions of today as “stuff of history” and claim that these religions of exclusivity, intolerance, and perversions of truth are the root of all evil and the cause for all of the world’s social, political, and economic ills. “those who have held blindly and selfishly to their particular orthodoxies, who have imposed on their votaries erroneous and conflicting interpretations of the pronouncements of the Prophets of God, bear heavy responsibility for the confusion and artificial barriers erected between faith and reason, science and religion”. “dying convulsion that is undermining the spiritual values which are conducive to the unity of mankind”. Of course the new world of peace will come when our Lord Jesus Christ returns to establish His kingdom on earth. God warns us not to be deceived by those who will try to pave the way for the Antichrists false peace and deception. The Bible teaches us that in the end times a global religion will be established. It is referred to as Mystery Babylon, the mother of all harlots, and it will ride in on the Beast that is Antichrist. We can see the beginnings of this global faith today in our increasingly ecumenical religious leaders, such organizations as the United Religions Initiative, the Parliament of World Religions, and in the United Nations. They also promote a redistribution of wealth and a communist system of government that would be able to bring about this leveling of the playing field. This brings to mind the Antichrist’s future financial system in which no one will be able to buy or sell without The Mark of the Beast. While the Baha’i praise the United Nations as the only hope for the “world peace promised by all the major religions”, they are not satisfied with its progress and are a loud voice on the international stage for stepping up the pace of our “spiritual evolution”. “work untiringly to exorcise religious bigotry and superstition from within their faith traditions and renounce claims to religious exclusivity and finality”. Baha’i writings also stress that force and coercion in matters of religion and belief are violations of the Divine command. This sounds reasonable. No one should be forced to accept a religion. However, Baha’i writings also consider simple proselytizing to be coercive. They believe humans should be able to investigate reality for themselves, and to present your truth to another is to violate that spiritual right. They believe all religions are equally valid and just different expressions of the same God, so there is no reason share your faith with others. So, just how do they plan to bring about this transformation? In a statement to the World Summit on Sustainable Development, the Baha’i community presented several possible next steps for transforming the United Nations. As a first priority, they proposed holding a convention on freedom of religion and belief to be drafted and ratified as expeditiously as possible by all of the governments of the world. They suggested the foundation within the United Nations system of a permanent religious forum, patterned on the UN’s recently founded Permanent Forum on Indigenous Issues. The creation of this body would be responsible for beginning the integration of religion into the UN’s work of establishing a peaceful world order. You can be sure that any religious leader who actually believes that Jesus is “the way, the truth and the life, and no one comes to the Father except through Him”, would be disqualified from participation. A belief in the Bible as absolute truth puts you in the category of intolerant and would make you guilty of prejudice. How very tolerant! Oppress someone’s conscience, have the nerve to believe the Bible is the only absolute truth, or claim there is only one path to God, and you will be eliminated. Once again, the Baha’i have written their script for the world’s future directly from the prophecies of the Bible, and have given us a perfect example of the Spirit of Antichrist that marks all false prophets and false religions.